Rome’s Jewish community is the oldest of the Western World, dating back to the second century. Today, there are approximately 15,000 residents of Jewish heritage in the Eternal City, many of whom claim to be the only true Romans! Join your private guide from Italy’s Best for a walking tour of the historic Jewish neighborhood and see its quintessential Roman shops and streets. 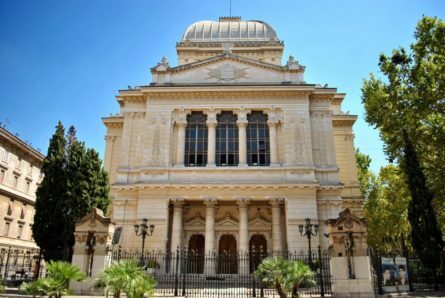 Tour Jewish Rome by visiting the great Synagogue built in 1904 and the adjacent Jewish Museum containing important artifacts, such as the original decree establishing the Ghetto, along with precious prayer books and priceless manuscripts. We will also discuss the continued influence of Jewish culture on Roman cuisine, from carciofi alla giudia (“Jewish style” artichokes) to the kosher baked goods churned out by the historic Boccione Forno. Located on the other side of the Tiber, Trastevere is one of Rome’s most popular neighborhoods, known for its restaurants and shops. Walk along picturesque Roman streets and piazzas that lead to Ponte Sisto, an ancient bridge connected to Tiberina. This tiny island dates back to the first century B.C. and though it is surrounded by many legends, is often associated with health and healing. Trastevere is also a haven for early Christian churches, including the church of Santa Maria in Trastevere with its mosaic encrusted facade and apses. We may also visit the church of Santa Cecilia or San Francesco a Ripa, which houses a sculpture by Baroque master Gian Lorenzo Bernini. The visit to the Great Synagogue and Jewish Museum is a group visit. A private guide can be arranged for an additional fee.